243 Rue St Charles , 75015 Paris, Frankreich. 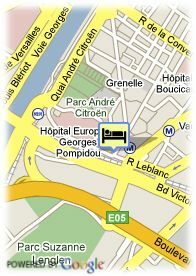 The hotel du Parc Saint Charles is a small charming hotel providing 15 rooms. Situated close to the "Parc des Expositions», Porte de Versailles, and not far from The Eiffel Tower and the 'Champs Elysées' offers a direct access to the main sites: Invalides, Concorde, Madeleine and Opera. All renovated in 2004 the hotel propose you a lot of services: Room service with restaurant 'La Dînée', air conditioning, laundry service.